Harley Quinn Vol. 3: Red Meat by Amanda Conner and Jimmy Palmiotti is a graphic novel featuring all the action, comedy, and even drama one would expect from the title psycho anti-hero. 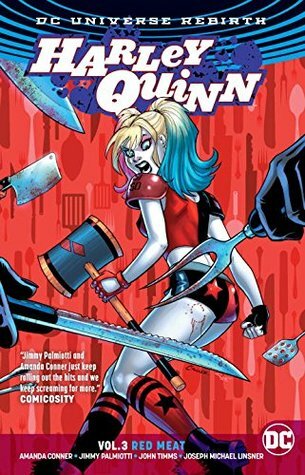 This graphic novel collects issues of Harley Quinn $14 – 21. My brain simply can’t comprehend that I enjoy the Harley Quinn comics so much, I find myself laughing at the gags and involved in the stories. Harley Quinn Vol. 3: Red Meat by Amanda Conner and‎ Jimmy Palmiotti was a lot of fun to read and easy to follow. There is a lot of fun world building in this book, and I really enjoy the fact the both the writers and artists didn’t take themselves too seriously. It looks like they had a blast working on these comics and it comes through. There are several new (to me?) characters in this graphic novel, but I didn’t find them confusing at all. I really enjoy how Harley Quinn interacts with everyone (she’s both mean and sweet), and how others interact with her knowing what she’s capable of. The social commentary in the book is done with a light touch, so it’s there if you want to read into it but doesn’t smack you in the face (a positive). Overall this was a solid, and fun book. The story progressed quickly, building up from the previous graphic novels (which are not necessary to read before getting this one). Harley Quinn is taking on the corrupt mayor of New York City who is paying cannibals to eat the homeless. Unbeknown to Harley, a former adversary names Harley Sinn is out of jail and looking for revenge. All the while a future fighter comes to the past so she could kill her before Harley kills Batman. But the real stress is trying to get her apartment clean before her parents come to visit. Dis­claimer: I borrowed this graphic novel from a friend.